Mrs Haseena Begum wife of Mr Ajmeri Khan was born in 1961 at Bahawalpur. 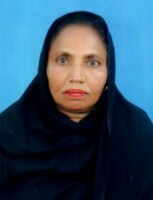 She served as Councillor, Union Council No.4 Bahawalpur during 2001 and as Labour Councillor during 2005. She has been elected as Member, Provincial Assembly of the Punjab in general elections 2013 against one of the seats reserved for women. She was Member, Bait-ul-Maal and Auqaf Committees Bahawalpur.